I love a project that costs very little and can be done quickly! Yesterday I remodeled a clock for just 59 cents. Here's how the clock looked before. 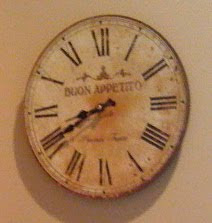 I liked it, but the writing says "Buon appetito" (Italian) and then it says "Provence, France." It was on clearance at TJMaxx for $2.00, so I bought it despite the mistake. Yet that discrepancy drove me crazy! So I spent 59 cents and a tiny bit of time to update a clock by simply taking a piece of scrapbook paper, measuring the center of the clock, and cutting out a circle of paper in that size. I cut a tiny hole in the center to accommodate the hands and a radius from there to one edge. It hangs in my little back entry hall. We all hang our keys here, and the hook that holds my purse and jacket is right below it. To one side is the door to the front porch; to the other is my DIY key art. I liked using the key theme on the clock as well. And yes, that is my new fall purse. I'm not sure the camera captured the color quite right; it's a lovely orange with brown trim. 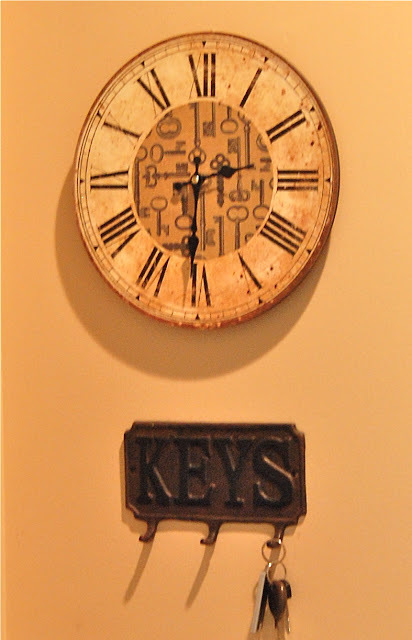 So do you think this clock will help me remember that time management is key to a happy home? Maybe?? 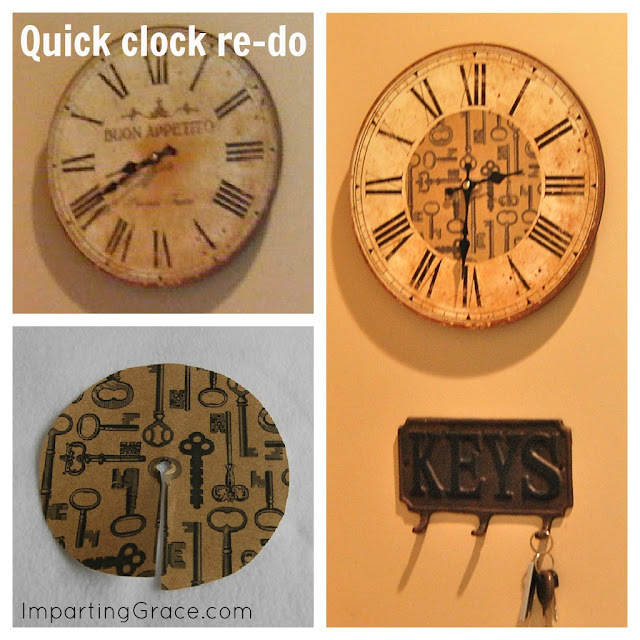 If you have an old clock that you don't really like, try giving it a new look with some pretty paper. This would work with scrapbook paper, wrapping paper, an advertisement from a vintage magazine, probably even with newspaper. I can imagine a clock for an office covered with stock reports or maybe a clock for a music room covered with sheet music. I'm joining my friend Melissa from 320 Sycamore, the guru of quick and inexpensive projects, for her "Under $10 Under 1 Hour" party. Check out lots of fun projects there! Great makeover! I love the patterned scrapbook paper. Great fix!! I also bought a clock like this and have a plan - but no energy to execute it - haha...soon! It's amazing how much difference something little like paper can make. I would never that thought of that. Thanks for sharing. Ha! You are one clever lady! What a great transformation...I love it! And you can't beat the price! Ah ha! You always come up with the best ideas ... for the BEST prices! So fun! Great makeover! And for 59 cents, you have a brand new, beautiful clock! Nice makeover! I also love the cute little hook area you have for your purse. That's a great idea! Great remodel. I like the pattern you chosse. Very pretty. Love it, love it, love it! 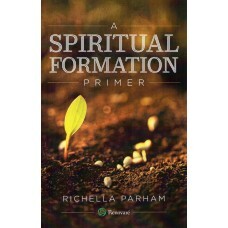 You are one clever gal Richella! That probably would have bothered me too...if I knew Italian:) I love that you used scrapbook paper with keys since it near where everyone keeps their keys! wow, you did good! Love it! I like the way you fixed this to suit your taste. It looks great! Wow, what a makeover, pretty Richella, you did a great job, fun and pretty too. Love the clock! Fun! So resourceful, Richella. And I'm drooling over your new purse. Do you think it's big enough to fit a few diapers and a pack of wipes? :) Someday I will need only my keys and some lipstick... and then I'll miss the diaper days, right? Another beautiful post! I'm seriously cracking up over the mistake on the original clock Richella! :-) I love how you made it over and it looks fantastic! Great makeover--and the price is right, too! Cute transformation and it looks perfect hanging over the keys. The purse is darling. I have a pretty orange bag for Fall, but have been using it all summer. Orange is the "IT" color this year!